Exit polls… Not as close an election as we were lead to believe? 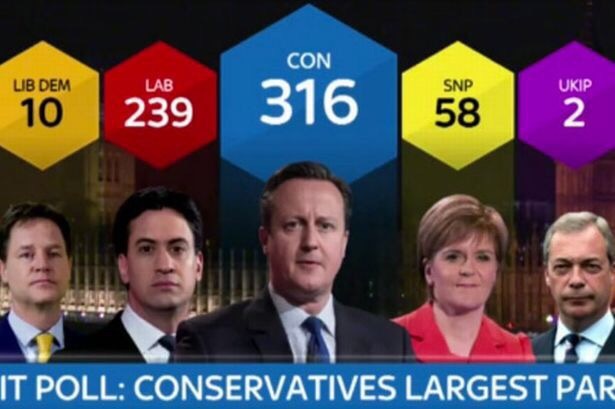 One downside to living in the future, is having to be up during your sleeping hours whilst Tory triumphalism pours through my social media feeds (though the sight of the SNP across from them will make interesting viewing). Labour must now focus on life in opposition, which is ironic because they have been anything but opposite in many of the key policy areas. There will be people who will scream at me about the disabled and the poor, the people we should have voted Labour for, as they have suffered the worst as victims of bedroom tax, but the harsh reality is that we must share responsibility for their suffering with our failure to act. Far too many of us have let the ConDem government get away with their actions this last parliament. Bedroom tax is poll tax by other means but this time we did nothing to stop it. At one time the public stood up to this and let the establishment know exactly how they felt about progressive taxes on vulnerable members of society, today, we have accepted the lies and propaganda of reality TV to demonise these people as a whole. Now Ed, it is said, must resign as the casualties from this open goal election start to reveal themselves. This election has been fought on fear. Fear of foreigners, the EU, fear of an economic downturn (not that it was the previous governments fault) fear of the unknown of alternative parties and it is fear that has won. The Tories look likely to almost secure enough seats for a majority, amazing considering the level of suffering experienced by the vast majority of this country for the last five years. Some are blaming the SNP after they surged to victory in Scotland, others will blame Russell Brand for first saying not to vote and then just hours before the polls opened a, endorsing Labour but Labour have only themselves to blame for tonight’s results. They must blame themselves for not being opposite enough and not giving us something that people could rally behind. Now it falls on us, as it always did, to offer the resistance needed against these tyrannical ideologies and protection for the most vulnerable in our society. Of all the things said by political commentators in recent weeks, the truest, most relevant thing is this; democracy is not a day out at the polling booth every five years but a daily act of vigilance and a commitment to hold accountable and challenge those people who took seats in Westminster. Without your consent, they govern nothing. You can still influence the outcome, you just have to be daring enough to do so.